TITUSVILLE, Florida - A man is in jail after he exchanged gunfire with Titusville Police at and apartment complex located on Mayfair Way around 5 a.m. on Sunday, November 19, 2017. 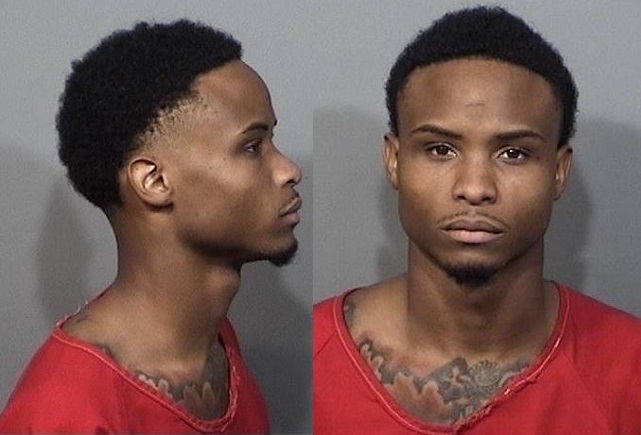 Investigators say that officers briefly exchanged gunfire with 22-year-old Harland Ramon Johnson, of Titusville, who discharged his handgun. Johnson was quickly taken into custody. There were no injuries as a result of the gun battle. Johnson was arrested and charged with Discharge of a Firearm from a Vehicle, Carrying a Concealed Firearm, Tampering with Evidence, Possession of Marijuana, and Possession of Drug Paraphilia. Johnson was booked into the Brevard County Jail without bond. In compliance with Titusville Police Department policy, an Internal Investigation is currently being conducted.